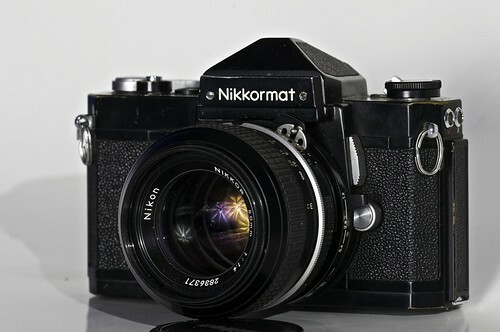 The Nikomat FT (Japan) or Nikkormat FT (elsewhere) was introduced in 1965. Original Nikomat/Nikkormat body with averaging metering (like the Nikon F Photomic T). No shutter speed display in viewfinder, meter needle brackets are thin without "+" and "−" markings, and the meter is manually indexed against the film speed. The Nikomat FS (Japan) or Nikkormat FS (elsewhere) was also introduced in 1965. Non-metered version of above. No mirror lockup. There would be no subsequent Nikomat/Nikkormat without a meter. The FT was superseded by the FTN. Nikomat & Nikkormat FT Camera Bodies" in Richard de Stoutz' "Nikon F Collection & Typology"
Nikomat & Nikkormat FS Camera Bodies" in Richard de Stoutz' "Nikon F Collection & Typology"
This page was last edited on 16 August 2015, at 19:36.